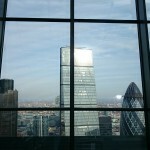 It was apparently a condition of the Walkie-Talkie’s planning permission that it should incorporate a public space. 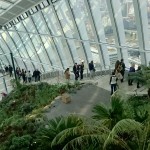 The resulting Sky Garden is a three story “square” at the top of the sky scraper, incorporating an open space on three levels with planted slopes and some upmarket eateries. As a public space it has, quite rightly, drawn some criticism on the accessibility front; you have to book a (free) ticket at least three days in advance, bring ID and pass through airport style security to gain entry for a 90-minute slot. Once inside, you take a super-fast lift to the 35th floor where you emerge to a scene of corporate luxury, all shiny granite walls, plate glass and a web of steel girders. The landscaped terraces inside the space are prettily-planted, with some seating areas, but they don’t exactly constitute a “garden”. It does, in fact, feel a bit like being in an airport. But – then you have the views, the free views. The Shard soars slap bang through the middle of your view to the South and you look directly down on the Tower of London to the East. The Thames snakes away in either direction and the City’s other tallest buildings, the Cheesegrater, Gherkin and Tower 42 stand side by side to the North. 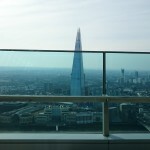 Sure, the Shard’s viewing platform is higher, but is the view really £25 better? We visited with Baby G and found the security staff helpful and friendly. Despite the online visitor guidelines to the contrary, we were able to take the buggy and didn’t have to fold it up or leave it downstairs. 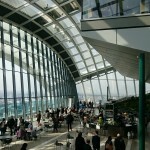 G had lots of fun toddling around the Sky Garden’s terraces, climbing the stairs to the upper levels and spotting boats on the river, planes passing over the glass roof to City Airport and trains running in and out of the local stations. The 90-minute slot is more than you would need unless you want to linger over refreshments in the bar. There were quite a few other tourists, but it didn’t feel crowded and the friendly reception folk advised that it shouldn’t ever feel much busier than it did on the weekday we were there. It’s undoubtedly a shame that the space isn’t more easily accessed by the public and will be closed in the evenings for corporate events. 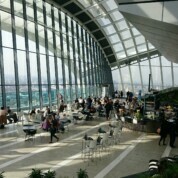 You also can’t take in your own food or drink as “you can purchase food and drink in the Sky Garden”, but the options are decidedly upmarket. On the other hand, the Sky Pod Bar on the Garden’s lowest level has great views, a nice atmosphere and according to its menu serves reasonably-priced coffee given the location (£2.50/£2.75), although the tea costs a startling £3.50 and most soft drinks cost more. Would we recommend it? Yes. You have nothing to lose given it’s free and you get a really good view of the City. I would definitely be tempted to return with family and friend visitors as long as I can be organised enough to book the tickets in advance. According the reception staff it’s possible to visit without an advance booking before 10am (but don’t hold me to that). By train: Aldgate (Circle and Metropolitan Lines), Bank (Central, Northern, Waterloo and City Lines, DLR), Cannon Street (Circle and District Lines), Fenchurch Street (National Rail), London Bridge (National Rail, Jubilee and Northern Lines), Mansion House (Circle and District Lines), Monument (Circle and District Lines), Tower Gateway (DLR), Tower Hill (Circle and District Lines).